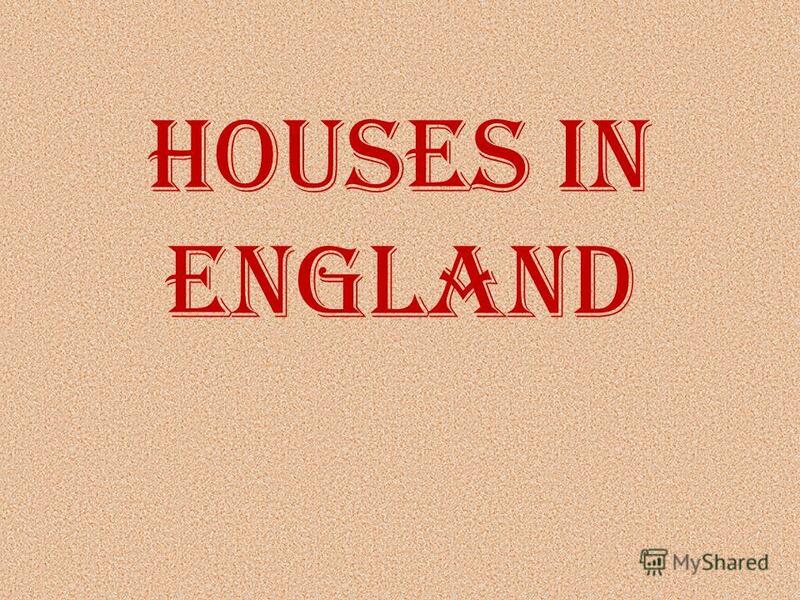 Презентация на тему: "Houses in England. 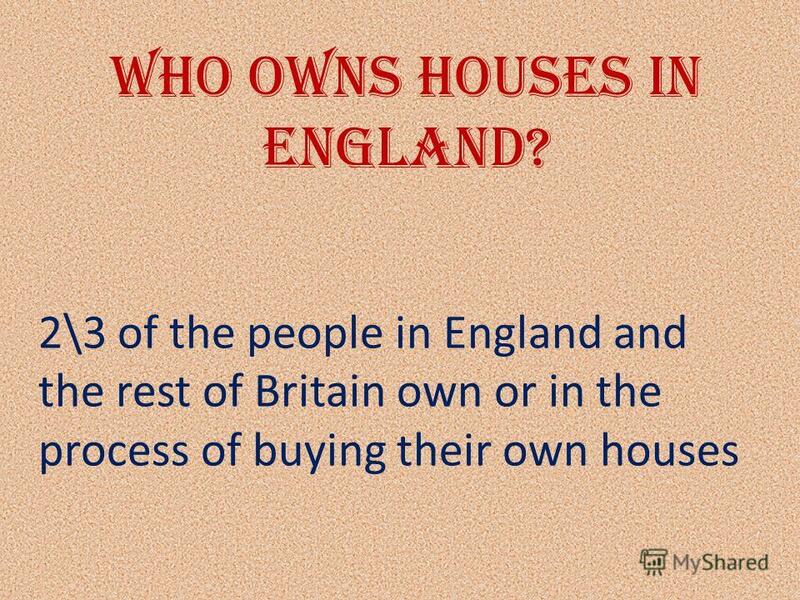 Who owns houses in England? 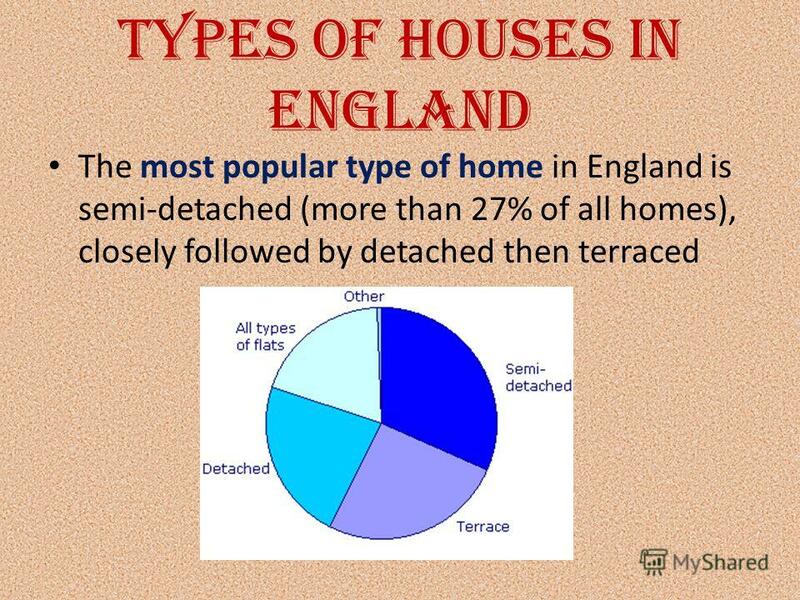 2\3 of the people in England and the rest of Britain own or in the process of buying their own houses.". Скачать бесплатно и без регистрации. 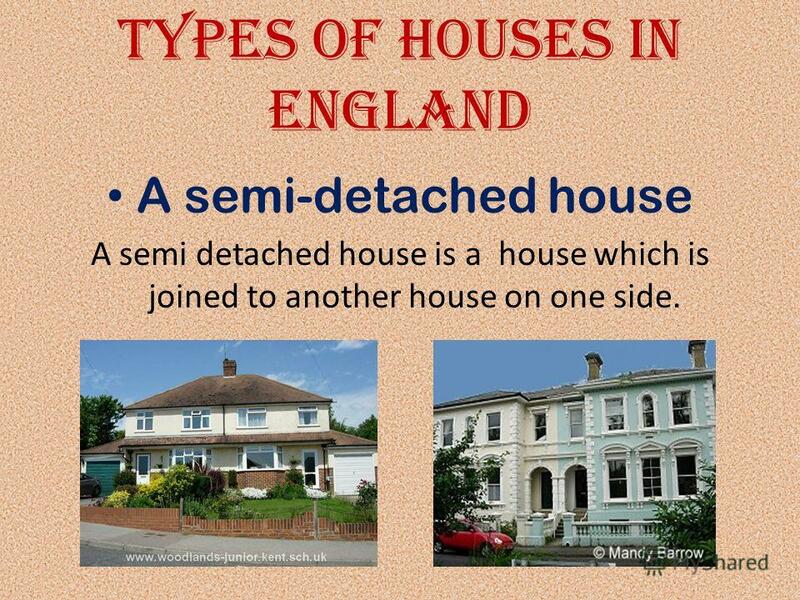 5 Types of houses in England A semi-detached house A semi detached house is a house which is joined to another house on one side. 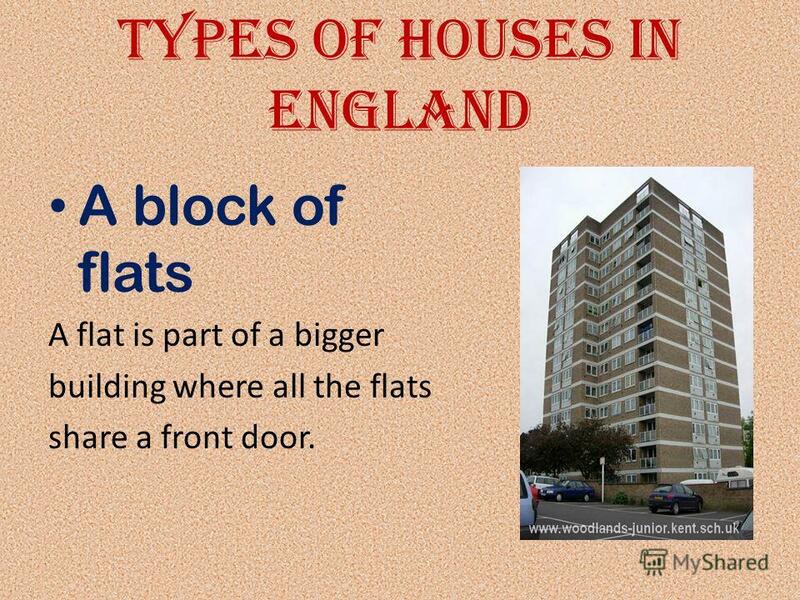 7 Types of houses in England A block of flats A flat is part of a bigger building where all the flats share a front door. 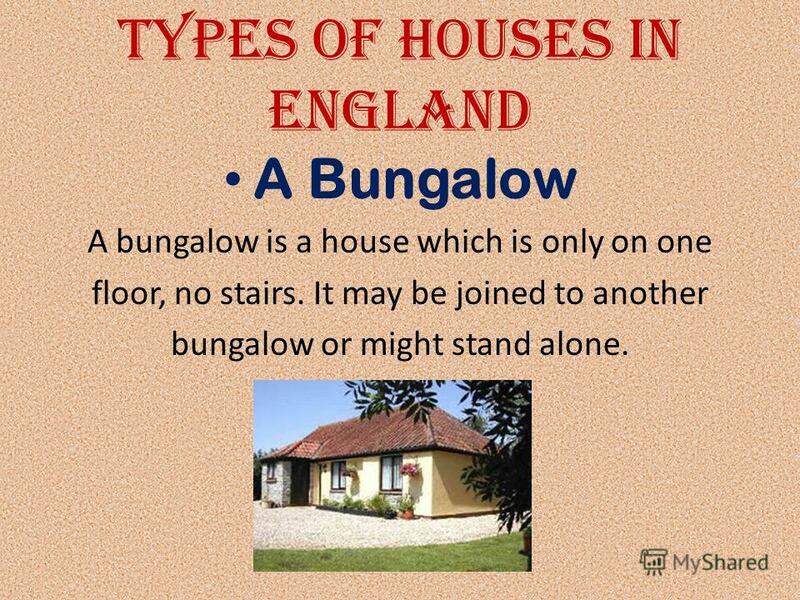 8 Types of houses in England A Bungalow A bungalow is a house which is only on one floor, no stairs. It may be joined to another bungalow or might stand alone. 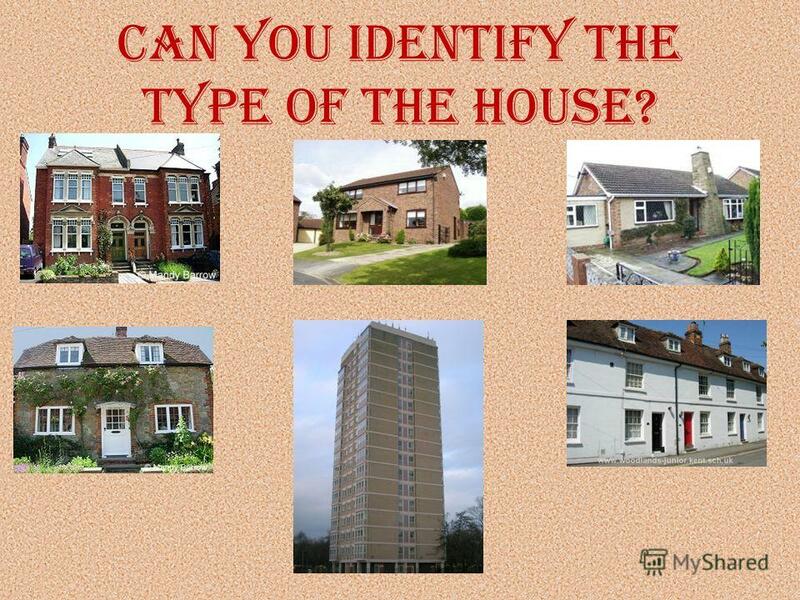 10 Can you identify the type of the house? Traditional English & Russian house. Execute by: Irene Abdullaeva Kate Pozdeeva Tais Pokrovskaya Directed by : Zubenko I.N. My Home, My Castle. Дом house home (= здание) (= родной очаг) This is a house. The house is grey. I come home at 5 p.m. every day. 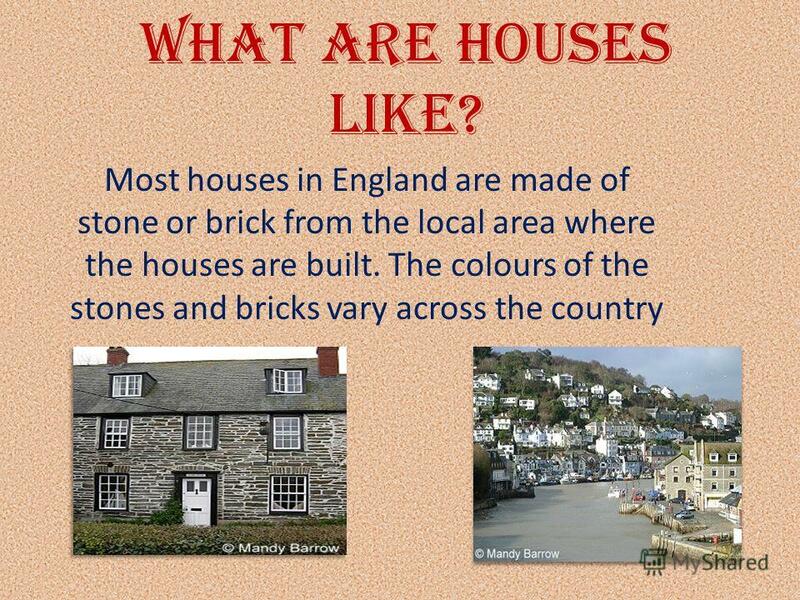 A Typical British House. 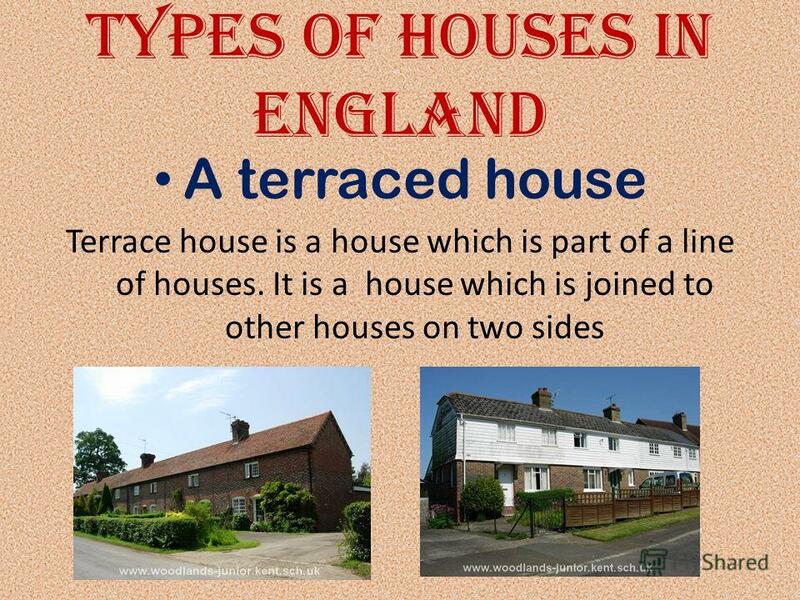 A typical British house is for a family of three or four people. Bolshaya Sosnova With Its Houses If you come to Bolshaya Sosnova,you can live in: detached houses,semi-detached houses, cottages and blocks of flats. HOME, SWEET HOME…. [rezidenl] [eəriə] [neibəhud] [di´tætt] [sεmidi´tætt] [tεrest] [ja:d] [kiŋdəm] [ka:sl] Residential area Neighbourhood Detached Semi-detached. Выполнил: ученик 6А класса МОУ СОШ 26 с.Краснокумского Георгиевского района Ставропольского края ПУГАЧЁВ АРТЕМИЙ Руководитель: ТОРБЕЕВА ЕЛЕНА ВАЛЕНТИНОВНА. They are big or small. They have kitchen gardens. 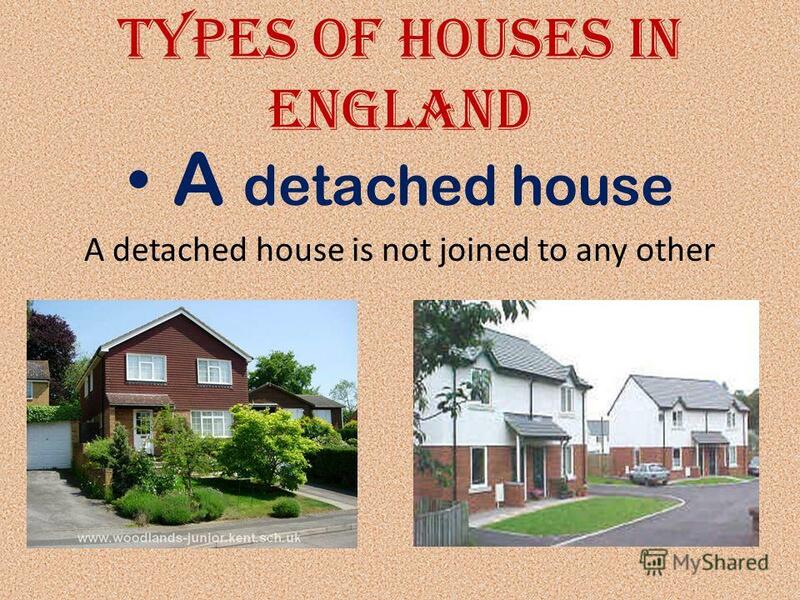 Middle class people live in detached houses detached houses are made of brick and wood. In the houses. A S ANY LANGUAGE IN THE WORLD A SIGN LANGUAGE HAS MANY ADVANTAGES. F IRST OF ALL, IT IS QUITE RICH TO SHOW THE MOST IMPORTANT MEANINGS THAT EXIST IN ALL. Travelling by plane Travelling by train Travelling by ship Travelling by car Hiking and hitch-hiking Travelling by bicycle. Great Britain London Dear friends, hello! I am writing to you from a distant country - Great Britain. The country, where boys and girls just like you. Look at the pictures. What might the young man be?